The South Australian government will take back control of development of the former Royal Adelaide hospital site after a $1 billion deal with a private consortium collapsed. The government was engaged in negotiations with the John Holland and Commercial & General joint venture. Their offer was rejected because the government says it did not represent the best value for South Australian taxpayers. The relaxation of height restrictions for a proposed apartment tower as part of delivering 1200 new apartments and a five-star hotel was at the heart of their plan. In a statement released on Tuesday, the government said the decision paves the way to better realise the government’s vision for a mixed-use development including returning 30 per cent of the site to the Botanic Garden, opening up 70 per cent of the site to the public and developing educational and research facilities. The old Royal Adelaide Hospital site is a once-in-a-lifetime opportunity in the heart of one of the world’s most liveable cities, so it’s critical that the redevelopment delivers a first class result for all South Australians," South Australian Premier Jay Weatherill said. “We don’t want to see this vital piece of our city fenced off for years to come and left to the market to dictate what happens and when. There has been speculation the developers -- the South Australian property group Commercial and General and property company John Holland -- are considering legal action. The size and scale of planned residential development on the site will be substantially reduced. The private leaseholds, proposed by the private developers, have been removed and instead there will be a focus on student accommodation, aged care living and short-term accommodation. Work has already begun on the demolition and activation of the old hospital, including lighting installations on the heritage buildings along North Terrace. 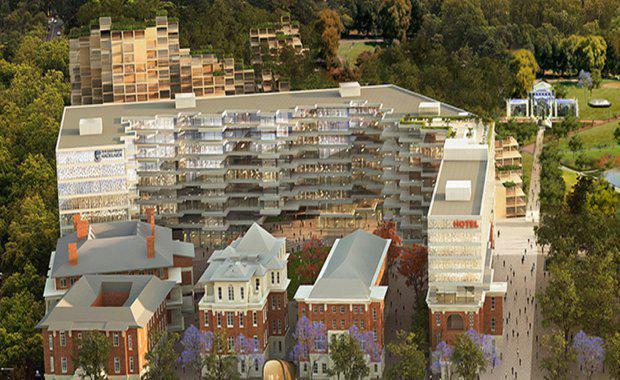 The government said following on the success of projects at Bowden, Tonsley and Festival Plaza, they will adopt the same approach for the prominent North Terrace site. The new $2.1 billion Royal Adelaide Hospital located 1km to the west, which has been beset with its own problems, welcomed patients and staff earlier this month.